Prayer was the backbone of Jesus' life and ministry. From his baptism to his crucifixion, the Gospels portray Jesus as a man of prayer who knew and deeply valued intimate communion with his heavenly Father. What can we learn from the prayers he prayed? 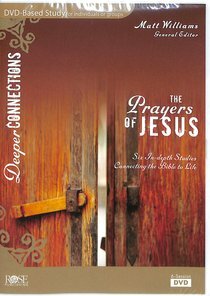 In six engaging and interactive small group sessions, this Deeper Connections DVD study explores the prayers of Jesus, revealing new insights into prayer, the character of God, and your relationship with him. Unlike most Bible studies available, each session begins in Israel, making it easier to experience and understand the cultural background of key teachings of Jesus. This dynamic and easy-to-understand study is written and taught by biblical experts with specialized areas of knowledge. It comes with a downloadable leader guide-so anyone can lead this study! Also available: Participant Guides (ISBN: 9781628627695). 25-35 minute teaching sessions with optional audio reading and a flexible structure design to facilitate group discussions. Practical Applications. Accurate, encouraging, and challenging applications of the Bible's message to life today. Also available is a FREE leader guide with step-by-step suggestions to get the most out of this study including a materials list, session outlines, time frame for 60- and 75-minute session options with extensions, leading tips, and more! It's never been easier to lead! Perfect for small groups, Bible studies, or personal use. The Deeper Connections series is unique. Unlike any other Bible study available, this visually stunning DVD series is written and taught by biblical experts - six professors with specialized areas of knowledge. Don't let the word deeper scare you. These engaging and accessible studies are for everyone who wants to deepen their understanding of God's Word and apply it more faithfully and effectively. In fact, a full one-third of each study is centered on modern application of Jesus' life and teachings. About "Prayers of Jesus - 6-Session DVD Bible Study (DVD Study) (Deeper Connections Series)"